Businesses could save 76% on their Amazon EC2 budget using a freeware application by remote support software provider Simple-Help.com. A free EC2 Scheduler application released today by Simple-Help.com could save businesses 76% on their EC2 budget. EC2 is a server hosting platform provided by Amazon. Servers can be created from 'instances' (template servers) in Windows or Linux and can be spun up in a matter of minutes via their online web interface. SimpleHelp set up Amazon Machine Images preloaded with their remote support software in late 2010. Since then they have seen significant take-up with many customers seeing it as an easy option to quickly get up and running. As their EC2 customer base grew feedback was good about how the EC2 platform performed but customers repeatedly asked SimpleHelp about EC2 scheduling solutions. Since EC2 instances are paid for per hour (from a couple of cents per hour on the smallest 'Micro' instance up to over a dollar for the 'Extra Large' instance), customers needed to schedule their instances to switch them off and stop paying for them during times they knew they wouldn't be using them. Online services exist for EC2 scheduling but are currently paid services. Customers also reported that they were unsure about providing online services with their Amazon EC2 credentials. 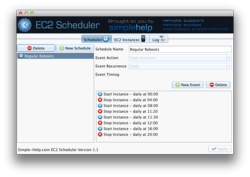 As demand grew, SimpleHelp decided to invest in creating a free EC2 scheduling app, allowing customers to schedule their remote support (or any other) servers on EC2 for free while retaining control over their EC2 login. For many businesses this translates into a huge potential saving of 76% if businesses schedule their instances to be available during the average working week. SimpleHelp are a UK based company offering self hosted remote support software.